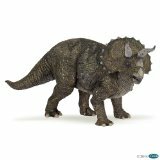 The Styracosaurus is a new release for 2011 and as usual Papo dinosaurs blow away the competition when it comes to realistic dinosaur toys. The Papo Dinosaurs Styracosaurus is hand painted and combines the detail to satisfy the dinosaur collector and the durability to survive a 3 year old’s play. The Papo Styracosaurus is for ages 3 and up and this dinosaur toy is quite durable although many collectors would not consider this a toy at all because of the fine detailing. The detailing on the Styracosaurus is in a class by itself. This dinosaur toy measures about 5.5 inches long and 4 inches tall and weighs about 4.5 ounces. One of the more interesting features of this dinosaur is its paint job, which has been given a pinkish hue by Papo to suggest a male Styracosaurus during rutting season. No one really knows what color dinosaurs were, if they could change colors like a chameleon, or had a rutting season. But this feature combined with the Styracosaurus with an upright heads back pose adds an extra bit of allure to the Papo Dinosaurs Styracosaurus. 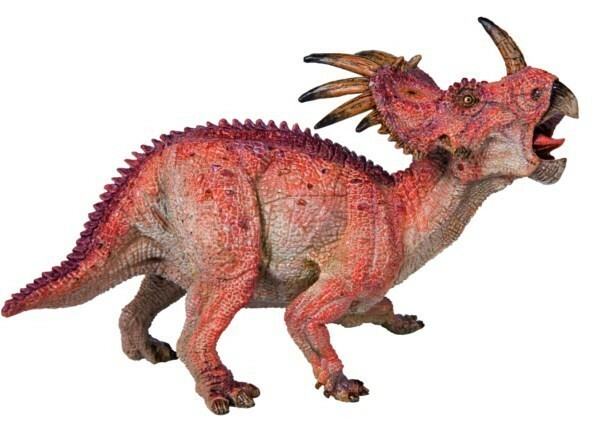 The Styracosaurus will make a very durable toy or welcome addition to any dinosaur collection. Amazing detail. A must for any collector of dinosaur figurines. Loos great! Papo really hit a high note with this Styracosaurus model. The expression is a great step up in toy sculpting, and the reason I bought this figure in the first place. Painting is good, although a bit duller than the brightness seen in the photo, but I’m not complaining. Not tiny like other figures, but a decent size for the child and collector alike. Good show! Amazing detail and paint job. Love the scale. Fits with my old Aurora Prehistoric Scenes model kits. 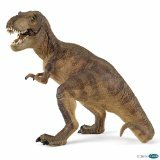 Dinosaurs Toys operates as an associate of Amazon.com and receives commission on purchases made through this site.